Mala beads are the "other Rosary". We have written a good deal about the Western or Catholic Rosary and how it may be adapted to the worship of our Mother God – but the Mala or Eastern Rosary has always belonged to Her. CRYSTAL MALA BEADS: This pure crystal sphatika mala has a cooling effect on mind and body. The sphatika rosary has always been recommended for the worship of Our Mother God in Her various Forms. The term "Mala" means a garland of flowers, just as the term "Rosary" means a garden of roses, for in all traditions a bead upon which one prays is also an image of the world-flower. In the East the World-Flower is the Lotus. In the West it is the Rose. Many Déanists simply refer to mala beads as the Estrenne Rosary or the Chanting-Rosary. In most cases, where differentiation is not necessary, it is simply called a Rosary. "The Fire-Maidens, each with the Rosary at her girdle", for example, clearly refers to the Estrenne Chanting-Rosary or mala beads, for that is the kind of Rosary the Votaries of the Fire-Temple use. Rosaries, whether Eastern or Western, are sometimes regarded as no more than devices for keeping track of numbers of prayers. In reality no one, east or west, regards them in such a mundane manner. They are generally seen as sacred items in themselves, and in the case of mala beads, the material from which they are made plays an important part. For example, sphatika crystal, a traditional material used for making beads, has a calming effect on the mind and has always been recommended for the worship of God in Feminine form. Such beads are recommended for wearing as well as for praying. Having them in contact with one's body has in itself a beneficial effect. or any other mantra of Dea. If more than one "round" is chanted, one should reverse direction at the Head-Bead and continue the other way. This is reminiscent of the Cycles of Manifestation, in which one Cycle is said to be the "reverse" of another – and yet the unchanging Thread of the Spirit our Mother runs through all. The very structure of a rosary makes it inherently a ritual object, for it is a model of the Thread Spirit (Strivatë) upon which the worlds are strung "as pearls upon a string". PEARL MALA BEADS: Wearing a pearl necklace mala has a cooling effect on mind and body. A pearl mala is also recommended for use when performing Japa of Devi mantras (particularly Saraswati and Bala). 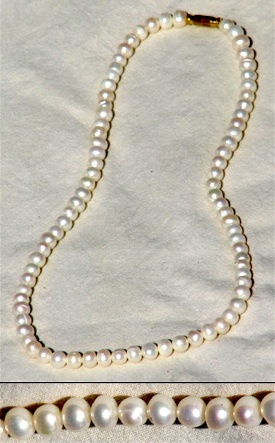 Rosaries made of actual pearl are said to have especially valuable properties, especially for devotees of Our Mother God. In many ancient cultures, pearls were symbols of the "Supreme Mother Goddess". In more recent patriarchal religion, the Pearl has continually been the symbol of the Spirit in Her aspect as the most valuable of all treasures, often lost and sought for. The Biblical "pearl of great price" is well known in the west, but it has equivalents in Taoist, Buddhist and other spiritual traditions. Thus the pearl is the Supreme Treasure of patriarchal traditions, and yet owes its sacredness to the original faith of Our Mother God. 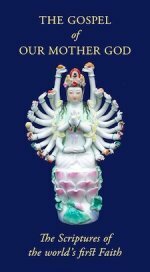 In India, where the worship of the Supreme Mother is still practised, the pearl is associated with both the Mother and the Daughter-aspect of Dea, known in India as Bala (see our page on Sri Lalitha). Pearl mala beads in the form of a necklace are thus perfect for the devotee of our Mother God and for the Filianist or Daughter-devotee. They can be worn as a simple but beautiful jewellery item, even in circumstances where one may not wish to advertise one's religion, but which confers blessing upon the devotee. And they can also be used for invoking or chanting the Holy Names of Dea.